I think its beautiful, none of mine are in bloom either but I have a few spikes, I guess that’s how it is when you have orchids,I hope yours remain happy. Did you see any red/ orange ones? I saw that one you got I believe. It was the last one. no cellophane wrap. no tag. I wonder if it tolerates warm conditions. What color were the other ones? congrats! I hope that radiator is not on! Mine did have cellophane and a tag, and there were maybe 3 or 4 other Masdevalias left. The only ones I saw were yellow, nothing red or orange. I put the plant on the radiator just to take the picture because the background is plain. Don’t worry, I never leave my orchids on hot radiators! yeah – was kidding about the radiator! but you never know you may forget! had some date seeds that germinated when I left the container on the radiator. Jordanian dates from Sahadi’s. Anyway I saw other Masdevallias a couple of months ago, some had a nice fuzz/ velvet on the petals. I emailed Matsui nursery to ask what hybrid/cultivar were, but never heard back. maybe you can ask them and be more lucky! Ooo, I love orchids with that velvety fuzz! Mine doesn’t have it, unfortunately, but it’s still pretty. 🙂 Were you able to plant the date seeds? Will have to try writing Matsui too and see if they get back to me. I bet it’s too hard for them to keep track of what everything is once they ship it out here from CA. 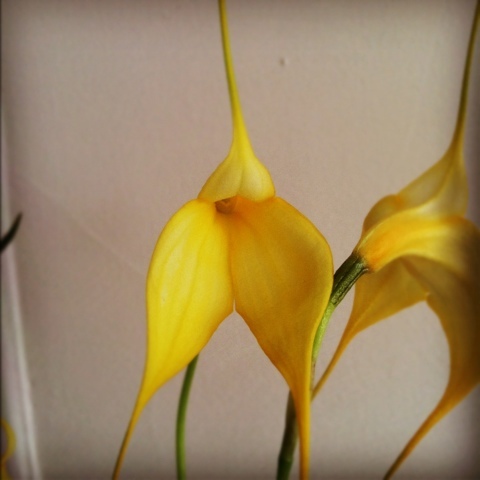 I like your Masdevallia – a friend of mine saw some red ones and she said the flowers looked like singing condoms! The ones that were velvety were not in very good shape. SO i passed.. I killed 2 masdevallias in the past, but I have now some Pleurothallis sp I was given that is growing nicely (no idea of what the flowers are like). I am more into species after all. But if I see another Masd I like I could get it. At Sahadi they sell dates from Jordan still attached to the branch. I read that date seeds can sprout after years, You need to soak them in warm water over night and clean them of any pulp. Put them in a deli clear container in perlite. just barely moist. They may take a long time to sprout. They need warmth/heat to germinate. At Sahadi’s they have the California dates on display. They are pitted and too sweet, The ones from Jordan are a bit on the side. They are cheaper and they taste a lot better. Singing condoms…LOL! Hopefully your Pleurothallis will bloom for you…they are so pretty! I have yet to go to Sahadi’s. I need to check it out sometime, it’s like a Brooklyn institution! Oh and thx for the care sheet link!! Beautiful orchid — have never heard about this one. Thanks. I got the same one from the Trader Joe’s in Chelsea yesterday! I got one too… the orange one with the velvety / shiny lip. It looked the most floriferous one. But all the blooms were faded. I saw a spike. And it was the most dehydrated one. I will stick into an Ikea vase to make it perk up. But who knows? 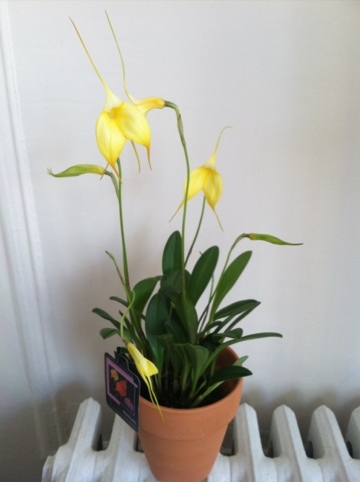 Congratulations on the new Masdevallia! It is gorgeous! I would kill to own it! and I am not a Phalaenopsis grower! I grow “Slipper” orchids – Paphs and Phrags, with alot of Aerangis and Angraecum, plus Masdevallia ….and that yellow Masdevallia is a gem ! Slippers are so beautiful! I have tried growing a couple Paphs and have not had much luck with them. I have one now that is doing ok though. I do love this Masdevallia! I hope I can keep it healthy! I too have had bad luck growing paphiopedillums. That was years ago. I believe I over-watered them having been told they like being moist. If I was to get a paphiopedillum now I would hold back on the H2O’ing. Living in NYC apartments, just not ideal. Getting any orchid to bloom is a challenge but so rewarding. What a gorgeous find! You are very lucky. We don’t have an affordable source like TJ’s where I live. I enjoy your blog, so keep up the posts. I looked up the conditions in my darker and cool apt. I wanted to find an orchid that like those condtions. From the Cloud forests in Peru!!! You got it Masdevallia’s. They also love higher humidiy. So I bought A cloche. It looks like art in the Living Room, and it was the first one ever I was able to Re bloom. Enjoy, it you end up with more, consider a terrarium. Funny you should say that — I actually just moved my Masdevallia into a small aquarium with gravel on the bottom. I pour water in the gravel as a makeshift humidity trade. The top is totally open so it’s not so much a terrarium as a pretty way to display the orchid. But hopefully it will thrive like that! The one I got perked up, the medium was dry but the one bud blasted! Good tip about the hydrogen peroxide, I will try that. Some of my Masd. buds opened and others that weren’t as developed have blasted. A couple of the blooms are wilting now, but it seems to be doing ok overall. Thanks for the advice! Yes, the new flowers will blast very easily with the heat that is on inside any Brooklyn apartments. 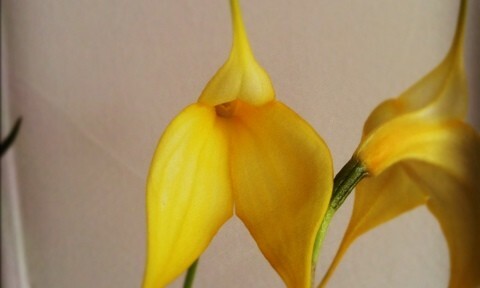 I have 8 masdevallia plants, all of which are located in the back hall where the temperature now rarely goes over 70C. Nice little blog you have, do you happen to know if there is any inner-city orchid society in Boston? I am from Australia and working here for a couple of years. I have grown orchids for many years and would love to be in contact with other people that grow orchids. This is me on this Australian website, I would lot to share my experience with other people. Hi Chris, Unfortunately I don’t know of any orchid societies in Boston but I’m sure there must be something out there! American Orchid Society i a good resource and so is orchidboard.com. Happy growing to you! Mine’s now pushing three more spikes. I searched the web and think they are Masdevallia Aquarius.